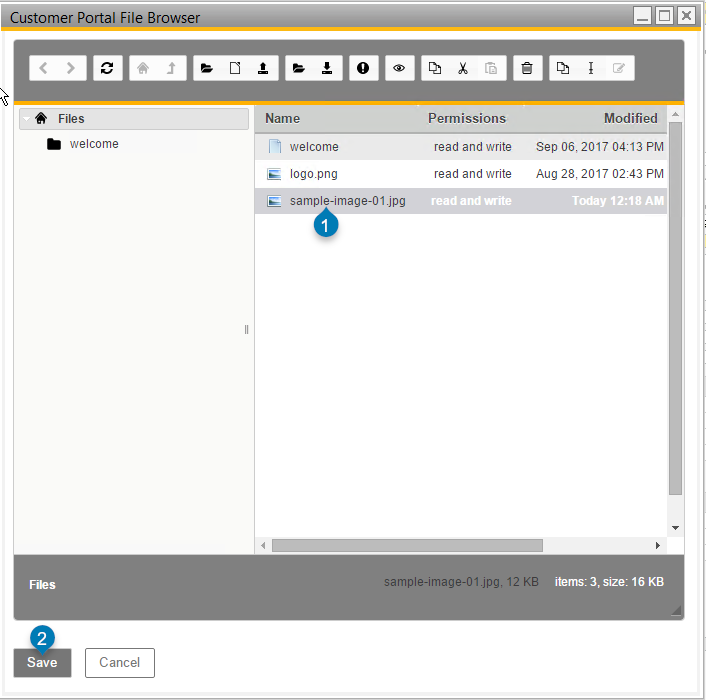 The Media Manager is used to manage Customer Portal website images and other media from within SAP Business One. 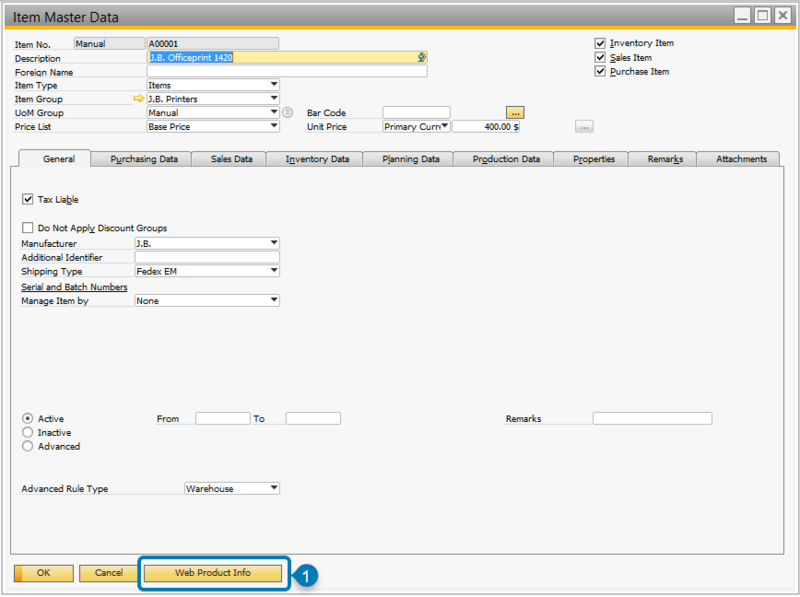 The Media Manager can be accessed in SAP Business One using InterConnect Manager Add-On. To open Media Manager, go to InterConnect Manager AddOn > Customer Portal B2B > Manage Media. Refer to the overview details below. Navigate back to the previous directory. Navigate forward (if the back button was previously used). Refresh/reload contents of the media manager. Use this if files are being managed by other users at the same time. For example, other users may also use the add-on, or other users may log onto the web server directly to manage media there. Navigate to the home (root) directory. Navigate up to the parent directory of the current directory (go up one level). Create a new folder in the current directory. Create a new text file in the current directory. Upload files (opens in a new window). View information about the selected object. Preview media (opens in a new window). Alternately, double-click a media image file name to open it. 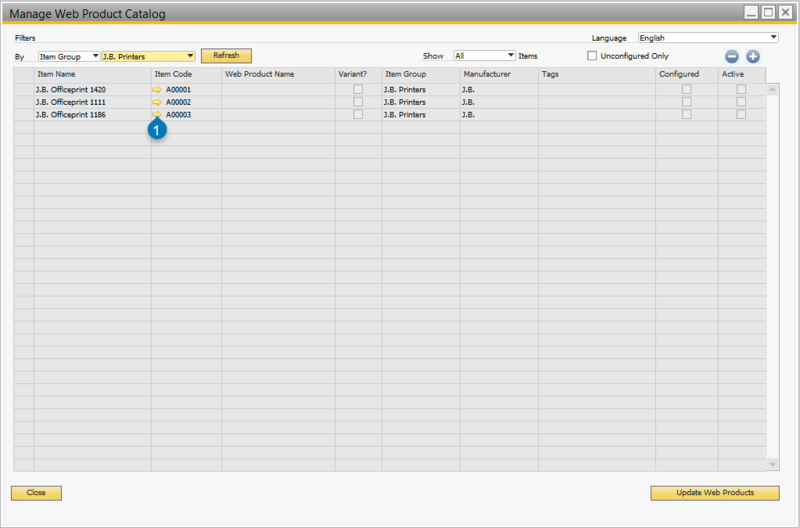 In SAP Business One, go to InterConnect Manager AddOn > Customer Portal B2B > Manage Products. 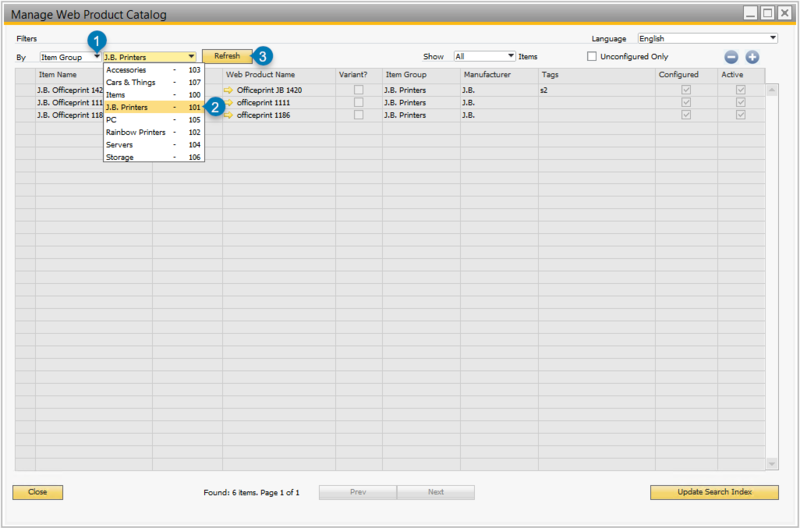 Choose Item Group as the filter from the first dropdown (marker 1 below), then select the name of item group (marker 2 below) which contains the product/item that requires an image. Press Refresh (marker 3) to apply the filter and see the resulting items. Select a filter (1) and filter parameter (2). Press the golden-arrow to open the desired item (marker 1 below) to open the Item Master Data for this item. Open the Item Master (1). Press the Web Product Info button (marker 1 below) to open the web details for this item. Press Web Product Info (1). Ensure there is a web name (marker 1 below) and press the golden-arrow (marker 2 below). This will open the media management screen. Add a Web Name (1) and press the golden arrow (2) to add an image. 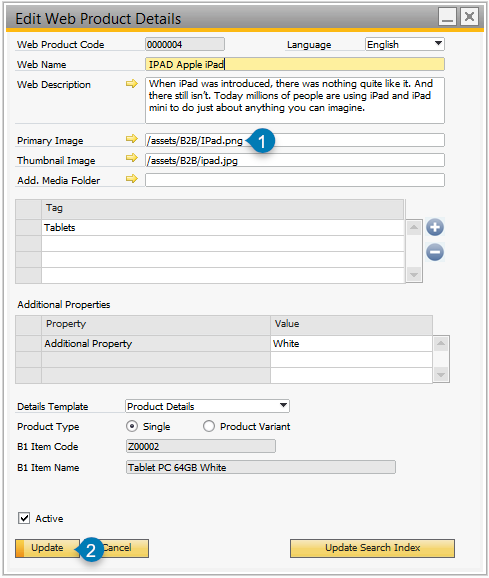 From the media manager screen, Right-click and select “Upload File” (marker 1 below) to upload a product image. 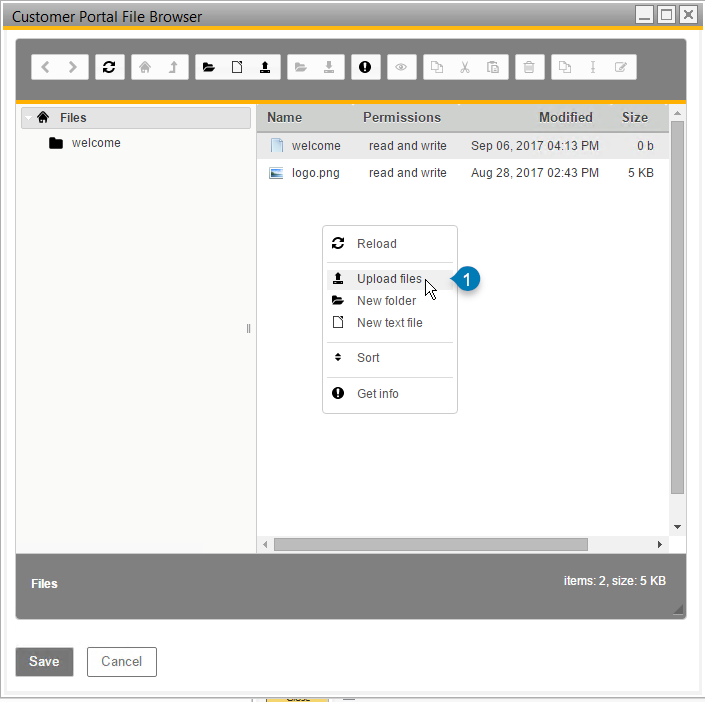 Find your file and upload it to the media manager. Right-click and select Upload Files (1). 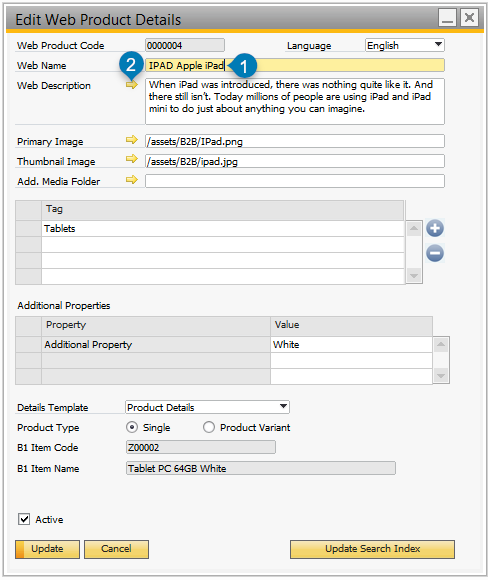 Select the image (marker 1 below) and press Save (marker 2 below) to add the selected image to the web product details. Select the image (1) and press Save (2). Note the image path has been set on the web product (marker 1). Update the item (marker 2) to save the image on the web product details. Image path is set (1), press Update (2) to proceed.